Whether it be for advertising, targeting messages, or just for general knowledge, knowing who your Twitter followers are is information that is useful to any company, or brand. Today, Schmap is launching its automated freemium service that gives any individual, company or brand immediate access to aggregate in-depth demographic analysis of their Twitter followers. 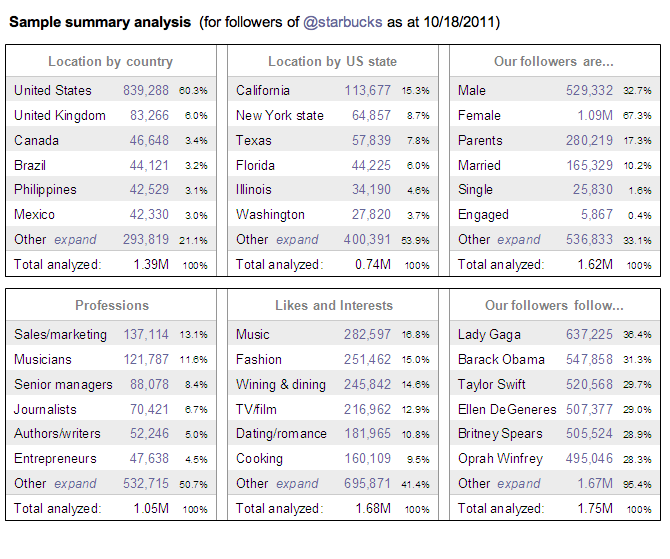 Schmap will breakdown Twitter followers at a basic level, segmenting followers by gender, marital status, profession, likes and interests, plus location by country and US state. The paid version of the service breaks down followers by same categories, plus location by city, breakdowns of technology usage, Twitter influence/activity and more. The paid service ranges from $39.95 to $149.95 for most corporations/brands; and $4.95 to $24.95 for individuals, charities and local merchants. Paul Hallett, CEO for Schmap, believes the service will be particularly useful to brands and corporations, ad buyers, the media, political campaigners, event promoters and local merchants to understand who their audiences are. For example, Schmap compared the follower profiles of a number of celebrities including Charlie Sheen, Sarah Palin, Tiger Woods, Bill gates, Wolf Blitzer, and Donald Trump. Schmap’s analysis showed that Charlie Sheen followers are iPhone users, tweet a lot and like to party. Sarah Palin followers are religious married parents who like reading books. Twitter users who keep pets most like Wolf Blitzer and least like Tiger Woods. Firefox users follow Bill Gates; Donald Trump is popular with fitness fanatics. Of course, it’s hard to imagine that Twitter wouldn’t offer some of these analytics, especially when it comes to providing more targeted advertising. Hallet admits that this is something that Twitter could release (the company is already moving forward on a number of analytics offerings) but he does believe that developers have a future in this area. While he says that some third-party developers have been burned before when Twitter has started to offer competing products, the advanced signaling with third-party developers is better now that a year ago.